Military communities face serious health risks from a class of chemicals known as PFAS. The Trump administration tried to hide the severity of the risks. Now it's time to act. Hundreds of sites across the US, including military facilities where thousands of service members and their families live and work, have been contaminated for years with a class of toxic chemicals known as PFAS (per- and polyfluoroalkyl substances). PFAS exposure is associated with a host of health impacts, including various cancers and reproductive and immune system problems. Documents obtained by UCS through Freedom of Information Act request this spring showed that the Trump Administration had suppressed a government assessment on the health effects of PFAS, calling it a “public relations nightmare.” Soon after, public pressure and a bipartisan congressional effort led to the release of the study in June which revealed that PFAS exposure could be dangerous at levels EPA considers safe. The 2018 assessment by the Agency for Toxic Substances and Disease Registry (ATSDR), a division of the Centers for Disease Control and Prevention, finds that the safe level of PFAS exposure is 7 to 10 times lower than the EPA’s non-enforceable drinking water advisory. The Center for Science and Democracy has mapped 131 military sites at which PFAS contamination has been found in drinking water or groundwater. All but one of them exceeded the ATSDR safety threshold of 11 parts per trillion. Nearly two-thirds were more than 100 times higher than the safe level. Using data from the US Census Bureau's 2014 American Community Survey, we determined that more than 6 million Americans lived within a three-mile radius of one of these sites in 2017. Click on a site marker to see the name and service branch of the site, the level of PFAS contamination found there, and the number of people living within a 3-mile radius in 2017 according to the US Census Bureau. PFAS, also known as highly fluorinated chemicals, are a group of man-made substances able to withstand extreme changes in their surrounding environment. This molecular strength makes PFAS useful in products ranging from firefighting foam to waterproofing to microwavable popcorn packaging. When released into the environment, PFAS can travel far from their source; people then consume them either in drinking water or by eating other exposed organisms. The persistence of PFAS as they move through these environments heightens the chance of human exposure. Awareness of this risk has prompted the EPA and the Department of Defense (DoD) to test for the presence of PFAS, producing the data we used in our analysis. Another analysis by the Environmental Working Group has shown that nearly 100 million Americans may have PFAS in their water. The data on PFAS contamination add a new chapter to a long history of disproportionate exposure to hazardous substances for those living on or near military bases. In addition to PFAS, military members, their families and nearby residents have faced risks from toxins ranging from perchlorate and benzene to lead paint. Nearly 900 military-affiliated sites have been declared Superfund sites. 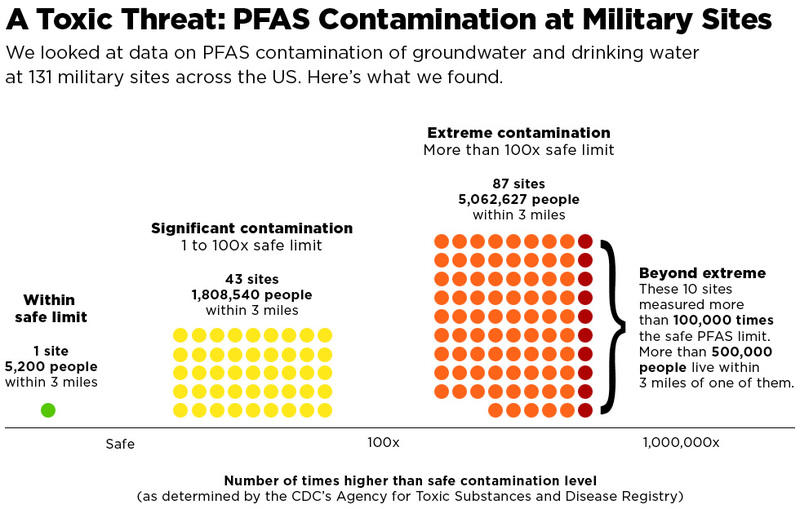 PFAS risks for military communities remain high largely because of the military's continuing use of PFAS-containing firefighting foam. In the face of heavy chemical industry lobbying, the military has chosen to replace older foams with new ones that use shorter-chain PFAS molecules, rather than using PFAS-free foams—despite the fact that many airports and corporations, as well as the Norwegian and Danish air forces, have made the switch to PFAS-free foams. Several steps can help lower ongoing risks for those on the front lines of PFAS exposure. Ban all new varieties of PFAS and new uses for this class of chemicals. Ban the use of PFAS in firefighting foams used at military installations and airports and switch to alternative chemicals. Set enforceable drinking water standards for PFAS. Mandate reporting of PFAS releases, investigate drinking water contamination, and disclose all key information to the public. Add the entire class of PFAS to the EPA’s toxic pollutant list and hazardous substance list. Provide support to states to clean and filter contaminated water sources, including standardized PFAS test methods for a broad range of legacy and replacement PFAS. Demand accountability from PFAS manufacturers, including ensuring their full responsibility for cleaning up contamination caused by these compounds. Notify retired and active military personnel and their families about any potential PFAS exposure in drinking water and groundwater and protect them from further exposure. Remediate water supplies on or near military installations contaminated by the US military’s use of and/or disposal of PFAS. Support scientific research on the health effects of a broad range of PFAS.